New energy-conservation research at Arizona State University could end up hitting quite close to home. The research team he leads was recently awarded a $2.19 million grant to develop energy-conscious technology aimed at lowering energy costs and increasing comfort for homeowners. The grant is part of a $31 million investment in an Advanced Research Projects Agency-Energy (ARPA-E) program to develop window coatings and windowpanes to increase energy efficiency of single-pane windows. The program, dubbed Single-pane Highly Insulating Efficient Lucid Design, or SHIELD, doled out awards to 14 universities, laboratories and businesses to create technologies that offer an alternative to complete window replacement. Holman and his co-principal investigators, associate professor Chris Hogan and assistant professor Eric Toberer of the University of Minnesota and the Colorado School of Mines, respectively, are working on an approach that employs a novel delivery system to apply three layers of particulate coatings to windowpanes. 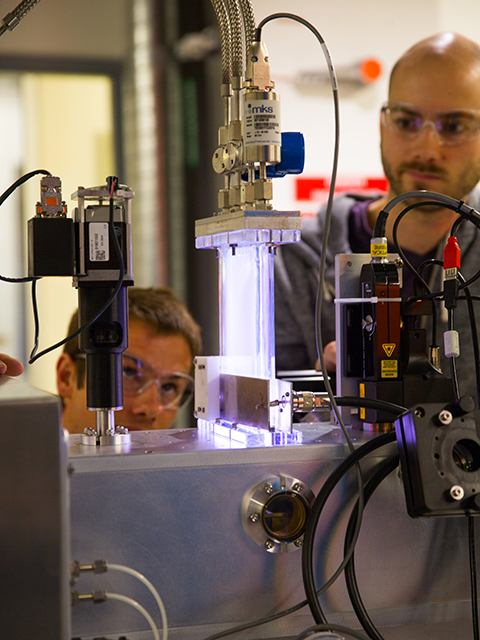 Their system sprays nanoparticles suspended in a gas — an aerosol — onto windowpanes during manufacturing to form a coating. The coatings not only improve thermal insulation, but also reinforce the mechanical strength of the pane, prevent condensation and provide a degree of soundproofing. These features were suggested by ARPA-E as a result of market research, according to Holman. Holman noted that the aerosol process, which differs from the commonly used wet chemical approach to apply window coatings, is estimated to cost only $1 per square meter more than existing panes. Holman and collaborators anticipate these windowpanes could save each homeowner approximately $100 annually in energy expenses. Single-pane windows, commonly found in homes built before the 1980s, can represent up to 20 percent of a home’s energy loss. In addition to being expensive, double-pane windows are also known to fail, as the seal between the panes leaks, causing condensation and hampering their efficiency. Holman posits that thermally insulating single-pane windows would actually be better for homeowners than their dual-pane counterparts. Though the bulk of Holman’s current research centers on solar cells, this isn’t his first brush with nanoparticles. “I think of myself as a mutt,” said Holman, referring to his varied academic career, which encompasses physics, mechanical and electrical engineering and microelectronics. “My PhD research was on synthesizing nanoparticles and depositing them, so this project is kind of a mash-up of a few areas of my work,” he added. While the project draws on Holman’s research experience, the outcome has potential to impact him personally as well. Both Holman and his research collaborators all live in homes with single-pane windows. Holman’s home, built in 1930, still features its original, single-pane wavy glass windows. As to be expected with any 80-year-old structure, the windows have seen better days, according to Holman. “The caulking is old and failing, some panes are cracked and we’d really like to replace them all, but my wife digs the wavy glass. I like it too — it casts great shadows in the morning,” said Holman. He has acquired every type of wavy glass made in the U.S., and all are largely the same, providing no thermal insulation or soundproofing. Through his work on this project, Holman hopes technology will emerge that gives him and other homeowners more options when it comes to window replacement. “This is a unique project in that my collaborators and I are not only interested in the science and engineering outcomes, but we also have a vested interest in developing this technology for our own use,” said Holman. This award comes on the heels of Holman and graduate research associate Peter Firth establishing a company to commercialize the aerosol deposition technology they developed. Called LN Tech, the business recently landed a $45,000 investment after Firth’s successful pitch at the New Venture Challenge entrepreneurship program. Geared toward graduate students, the inaugural event was jointly held by the Ira A. Fulton Schools of Engineering and the W. P. Carey School of Business. Though Firth pitched LN Tech as a company aimed at improving displays such as TV screens or computer monitors as well as antimicrobial fabrics, in light of this award, they now have a renewed interest in the window-coating market. For more information about the SHIELD program and a complete listing of the awards, visit ARPA-E online.